Register now to reserve a seat. 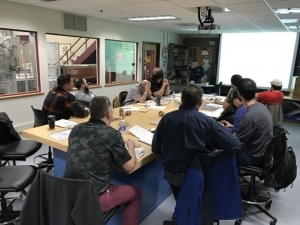 The Woodwork Career Alliance of North America is organizing several Accredited Skill Evaluator Training events over the next few months, including sessions during the AWFS Fair this summer in Las Vegas. Other sessions are planned for Madison, WI; and Colorado Springs, CO. The course fee covers the half-day training session and materials plus a one-year membership as a WCA EDUcation™. 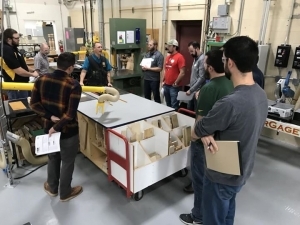 EDUcation members also gain access to the WCA’s online archive of training videos and other valuable materials that they can use to develop or enhance their woodworking training programs. ASE’s are a vital link of the WCA’s credentialing program. 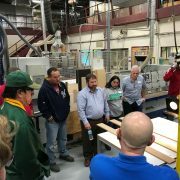 In most school woodworking programs, the ASE is also the instructor. An ASE is responsible for observing a person’s ability to perform a woodworking operation at a high enough caliber to earn tool points to fortify their woodworking credentials. To date, more than 260 woodworking instructors and professionals have been certified as accredited skill evaluators by the WCA. WCA ASE training is offered as an optional upgrade on the third day of the three-day MiLL Academy event. The MiLL Academy is designed for CTE industrial arts teachers and their administrators who want to bring professional, industry-oriented programs to their classrooms. For more information and to register visit https://themillco.org/academy. This session was scheduled following a sold-out WCA ASE training event held at Madison College last November. The session is limited to 16 seats. For more information and to register, contact Patrick Molzahn, director of the Madison College Cabinetmaking and Millwork program at pmolzahn@madisoncollege.edu or call 608-246-6842. WCA ASE training is offered as an optional upgrade on the third day of the three-day MiLL Academy event. For more information and to register visit https://themillco.org/academy. The WCA will host seven ASE training sessions in its exhibit booth during the AWFS Fair. Morning and afternoon sessions are scheduled for July 17-19. A morning session will also be offered on July 20. Each session is limited to four seats. For more information and to register, contact Scott Nelson, WCA president, at snelsonwca@gmail.com or call 402-610-6043. To find out how to schedule a WCA ASE Training event at your school or business, contact Scott Nelson at snelsonwca@gmail.com or call 402-610-6043. 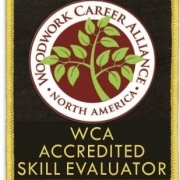 Learn more about the WCA and its credentialing program at www.woodworkcareer.org. The Woodwork Career Alliance of North America was founded in 2007 as a 501(c)(3) non-profit corporation and is governed by a volunteer board of directors. The WCA’s mission is to develop and administer a unified set of Skill Standards for the wood products industry. 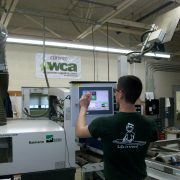 Since 2011, WCA has developed observable and measurable performance standards and assessments for more than 240 woodworking machine operations. 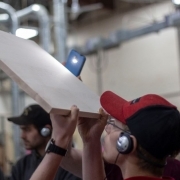 In addition, WCA has issued more than 2,000 credentials, a portable, personal permanent record documenting each holder’s record of woodworking skill achievements. More than 100 high schools and post-secondary schools throughout North America are WCA EDUcation™ members. 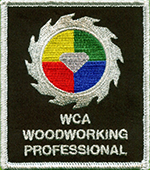 To learn more about the WCA and how to get involved with its programs, including sponsorship opportunities, visit WoodworkCareer.org.